Last year I was interviewed by Melissa Wilson, a Journalism student from the University of Newcastle, about my views on the Higher School Certificate (HSC). Melissa was in contact again recently, and this prompted me to ask if I could reproduce the interview here on my blog. She kindly obliged, and so here it is! The Common Curriculum Elements are generic skills that students work with across their subjects; therefore the real preparation for the test goes on all the time and in every subject. The QSA also makes available a variety of test preparation resources, including Retrospectives and past testpapers (see QCS Test publications and Retrospectives and MC response sheets). Most schools provide some focused preparation for the test. How do you feel about how the HSC is structured in 2011? When I think about the HSC structure in 2011, the main things that leap to mind are the fact that studying English is mandatory, that half of the student assessment is based on a timetabled external examinations, and that a no more than of 30% of your school assessment is supposed to be ‘exam-type’. I think it’s really important for English to remain compulsory right up to the end of school, but I’d like to see more room for students to choose electives within the course, not just different levels i.e. Standard or Advanced English. At the moment I think the HSC is still structured in a way that is too rigid for students to feel like they have a lot of choice over their learning. Many people say that the HSC is focused on teaching students a whole lot of information that isn’t exactly relevant to them later in life – but instead they just regurgitate it in an exam and then discard it – how do you feel about that statement? Personally, I can think of countless things that I learned in my HSC year (1998). In those days the emphasis on exams was just as great, but I am often surprised by the things I remember from senior high school and have found a lot of what I learned to be very relevant in life. Having to finish ‘major works’ for Visual Art and Drama also taught me valuable lessons about project management and self-directed learning, which I didn’t get from participating in written exams, so in that sense I guess I was lucky to be an ‘art-sy’ student. I think the real problem with exams is not that students have to cram ‘irrelevant’ information – I think that all learning can be made relevant, depending on what you choose to do in life. The problem I find is that the examination system has too much of an effect on what happens inside the classroom. The constant pressure to cover content is a strain on students and teachers, and even though school-based assessment is supposed to involve deep learning and reflection, many schools I know of set far more than 30% of their assessments in an exam style in order to condition students in preparation for the external exam. So I think there is a ‘hidden curriculum’ in the HSC, which can dilute learning experiences based on the official subject syllabuses. And from this, what would you personally change about the HSC? I think that the only assessment that students should have to do under exam conditions is the Trial. If more student work was assessed through project work, or using collaborative group tasks, or using portfolios, I think that students would feel more connected to the learning, and be motivated to achieve. Even though the HSC now uses criteria-based assessment, students are acutely aware that the HSC places them in competition with one another as in-class assessment ranks still play a role in determining a student’s final subject results, and the year culminates for most students in receiving a ranked national placement through the UAI. With only about 30% of students moving from school to university after Year 12, it seems like we compromise a lot of educational values for the sake of a privileged minority. How do you feel about the pressure and emotional stress that students endure throughout their HSC? When I think about the stories that students have told me over the years – about how they feel inadequate, or like a failure in the face of HSC assessment tasks – it makes me really upset. I have seen a lot of students in Year 12 lose a lot of weight, with girls in particular showing signs of early and advanced eating disorders. Senior school is also a time when increased numbers of students pick up casual and part-time employment, in many cases out of a necessity to contribute to household finances. I think the HSC creates an environment where students are given too many adult responsibilities without being given the corresponding rights. While schools play a vital role in developing students’ resilience and capacity for work, the emotional stress endured during the HSC year is too much, in my opinion. I read a study awhile back where Year 11 and 12 students reported symptoms of anxiety, depression and stress that fell outside the ‘normal’ range. We know that when this happens, students stop focussing on ‘mastering’ the material, instead focussing on performance; they stop believing in themselves, stop seeing the learning as a worthwhile goal, and switch to performance-oriented goals. Some of my own school friends took years to recover from the emotional damage of the HSC year, especially those whose final results didn’t meet expectations. This entry was posted on November 27, 2012, 1:01 pm and is filed under education, HSC, personal, reflections. You can follow any responses to this entry through RSS 2.0. You can leave a response, or trackback from your own site. Great interview. I didn’t realise we completed the HSC in the same year…What place do you see for an expansion of an English Studies type course? What impact does the raised leaving age have on the HSC, particularly English? What do you mean by an expansion of English Studies? Do you mean offering more than one non-ATAR option? Now there’s a thought. I’m not sure that the raised leaving age does anything to English in particular except create one nightmare Year 11 class of people who are waiting to drop out. English would feel this the sharpest I suppose, because it is mandatory.But in the end I think the onus is on the teacher of those students to help them resist the pressures of the HSC system around them, and get something out of the time. Take the disengaged kids outside for a break most lessons, and so what if this damages their test scores (I bet it won’t). So I guess I would say is that the impact is that more teachers have to face how boring their senior class pedagogies are, and want to do something about it. Just not sure if they will. 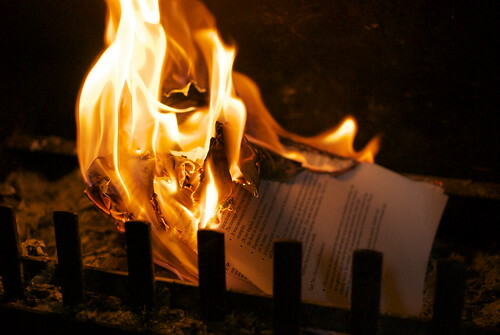 I think a new coming of age ritual in Australia is the bonfire of HSC notes. Our hatred of that period in our lives unites us all.